When you're a kid, having a summer birthday seems like the short end of the stick. Not only are all your friends away on vacation when you want to have a party, but you can't even bring cupcakes into school for your class! But I got over my righteous anger pretty quick, because I was a really, really lucky kid whose dad had a penchant for fruit trees. The white peach tree in our back yard would drop peaches at the exact right time each year for Dad to make me some of his peach crisp. Here's his recipe, Dadrat-approved. First, he'd make me collect all the peaches and check them for worms (pesky buggers; the antithesis of delicious!). But in case you don't have a white peach tree in your yard, or live in a cement box in the city (like yours truly), you can also buy peaches at the store. If you can find white peaches, they're really, really nice--softer, fibrous, tangy. You'll need about 4 cups. Unless you're doubling or tripling the recipe, which we usually do. Then he'd preheat the oven to 425. Or around there; Dad dislikes numbers and favors cooking impressionistically. But let 425 be a guidepost for normal people. Now while the oven is preheating, prep your peaches. You don't want any fuzzy skin in the crisp, so you're going to have to peel them. Luckily, there's a trick. 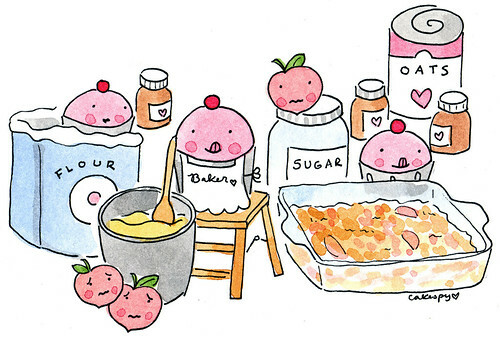 If the peaches are fresh, put them in boiling water for about 30 seconds. Apparently this is called "blanching"--which is particularly humorous if you're using white peaches already. But anyway. Take them out and let them cool, and the skins will come right off. Definitely wait until they cool, though, so you don't burn your mitts. Peel, and slice. Butter the bottom of a casserole and pour the peaches in. Squeeze some lemon (or lemon juice) over the peaches if you feel like it. If you want, you can throw in walnuts, too, which we never did when I was a kid, but which suddenly strikes me as an awesome idea, unless you are allergic to nuts, in whcih case I don't recommend it. But for everyone else, walnuts are both delicious and an excellent source of iron. Sprinkle this dry mixture over the top of the peach mixture in the casserole. If you like--and I do--sprinkle an additional teaspoon of brown sugar over the top. It gets sweet and crusty. Bake for about a half an hour. If you do it right, it doesn't turn to mush. My dad quothe, "The only reason to cook it is to heat it up." Now you can eat it. Keep up with Moonrat's rad adventures (and the occasional fuzzy animal picture) at editorialass.blogspot.com.